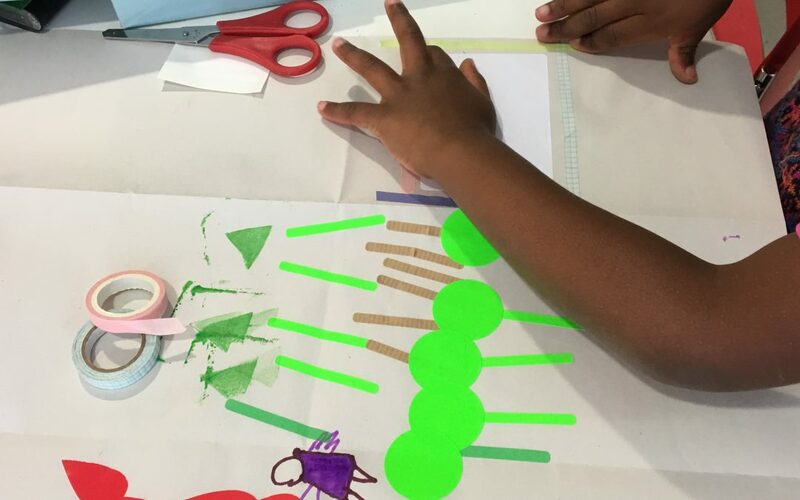 During the half term holiday we hosted a map making workshop for children to explore the ideas within the Stitching Stories exhibition of passage, journey, home and displacement. We provided them with a pre-folded blank map to fill using stamps, stickers, collage, drawings and tape. The children needed little prompting to get on with creating all kinds of real and imaginary locations. They enjoyed making symbols and patterns to represent significant landmarks and were keen to describe the worlds they depicted. By the end of the morning we had maps of holiday destinations, local parks, imaginary places made of sweets, farms and adventure play spaces to name a few. I loved how they included specific events in their ‘key’; like getting a splinter in the wooden boardwalk alongside the conventional geography of the beach and the sea. Several of the adults who came along also joined in and made maps of ‘home’. Whilst we stamped, stuck and drew we talked; sharing stories of places we had lived or visited, of family and discovered many unexpected connections. Our relationships to the places we live and travel to are often hard to quantify in how they shape our identity. How vividly these were recalled in the imagination made me reflect on the hardship of leaving the place you call home not knowing when you might be able to return.